For office or the work environment at the end of the day cleaning, iVision has developed a cleaning kit particularly robust dedicated to the sandblasting world. 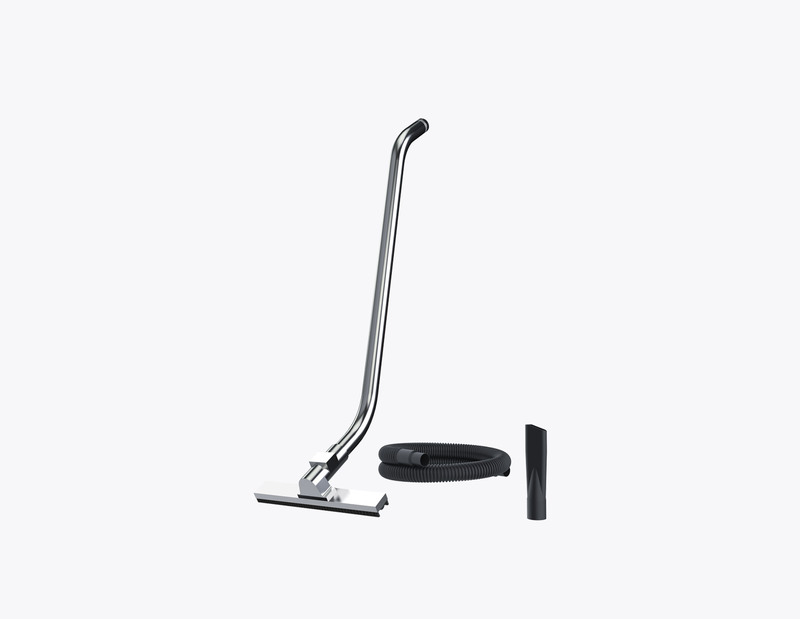 This version can be enlarged according to the specific needs of the client and can be easily attached through special supports on the side of the vacuum, this also helps avoid the tube from impeding the vacuum movement. Filter cleaning with a pneumatic piston requires being connected to an air adapter from 6-8 bar and via a pressure regulator that can vary the intensity of the sliding of the piston. •	To effectively clean the filters mounted inside the vacuum, the vertical piston filter cleaning system was developed. Through a manual selector (semiautomatic solution) or by a timer (automatic version) a pneumatic piston acts from the bottom of the filter, shaking it intensely in a way that ensures that the chips or the dust transferred to the outside of the filter fall into the collection tank, permitting in this way the continued optimal functioning of the filter. •	Vertical piston cleaning of the filter is recommended for any type of application, as it significantly improves the cleaning of the filter compared to the vibrating motor standard version. •	Vertical piston cleaning of the filter, especially in its automatic version, becomes mandatory in the suctioning of fine dust that can clog the filter rapidly. In the case of large and heavy chips, this system is not mandatory, but for light or volatile material, yes! •	The principal advantage of this system comes from the greater efficiency in the incisiveness of the shaking of the filter with a piston. Another advantage is the use of this system in its automatic version, shaking the filter every time that the motor is turned off, eliminating the typical problem of the reliability of the operator, who usually has to remember to turn on the cleaning of the filter. In the case that the vacuum cleaner standard capacity 42 Gal is not enough, iVision offers its customers additional high-capacity chip containers. The dumpsters are equipped with a visual filling indicator that shows the operator when it is time to empty the container.